Extensions for Primary/Secondary Data and Log Files – Are MDF/NDF and LDF necessary extensions? These extensions are the default extensions that are used by Microsoft SQL Server for the default system and sample databases available. Default extensions are good because it helps us to set some sort of uniformity across multiple Microsoft SQL Server environments. When we run the above script to create a new database, we find that the database creation is successful. In a new Query window connecting to the same SQL Server instance, we can fire a query using the sys.sysfiles catalog view to confirm that the SQL Server is indeed okay with the non-default extensions. I hope that this post helps clear out the misconception around the default primary/secondary data and log file extensions. 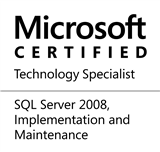 This entry was posted in #SQLServer, Blog, Imported from BeyondRelational and tagged #SQLServer on June 27, 2011 by nakulvachhrajani.